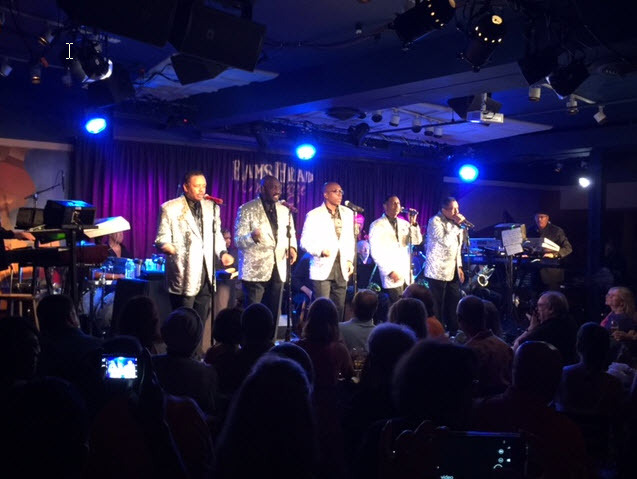 Although Annapolis is a hop, skip and a jump away, I thought it would be fun to give it more than a cursory visit and include some nightlife, wine life and a bit of water-centric fun. To that end we booked a few nights at the recently newly redecorated Annapolis Waterfront Hotel. Now part of Marriott International’s prestigious Autograph Collection brand, known for its spectacular portfolio of luxury hotels around the world, the hotel reflects a decidedly contemporary nautical air with stunning rooms overlooking the town’s main harbor. As the only hotel overlooking the waterfront, its central location allows visitors to walk to shops, restaurants and historical attractions. Travelers will be pleased to know they still provide all of the benefits of Marriott Rewards program. Boaters will love that it has its own dockage. In the past we have enjoyed Sunday brunch at the hotel’s Pusser’s Caribbean Grille with its waterfront dining and lively bar. Named for the 350-year old West Indian rum brand, their rum-based drinks are delicious and potent. Be sure to snag a bottle of their newest release called Gunpowder Proof from the onsite Pusser’s Company Store. You’ll be among the first to try it. This 109-proof dark rum has only been available stateside for one month. 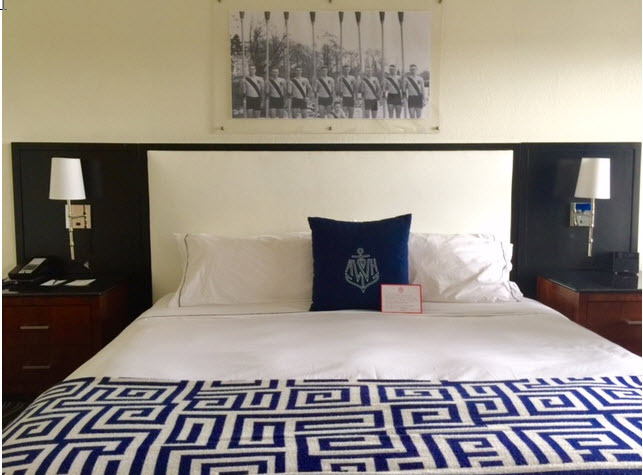 Hot Tip: When booking your accommodations be sure to inquire about the hotel’s special partnership with the Naval Academy. The “Exactly Like Nothing Else” package, allows overnight guests an opportunity to dine at the Alley Restaurant in the historic wood-paneled Officer’s Club. Dining in the club is an exclusive privilege normally reserved for Navy families. 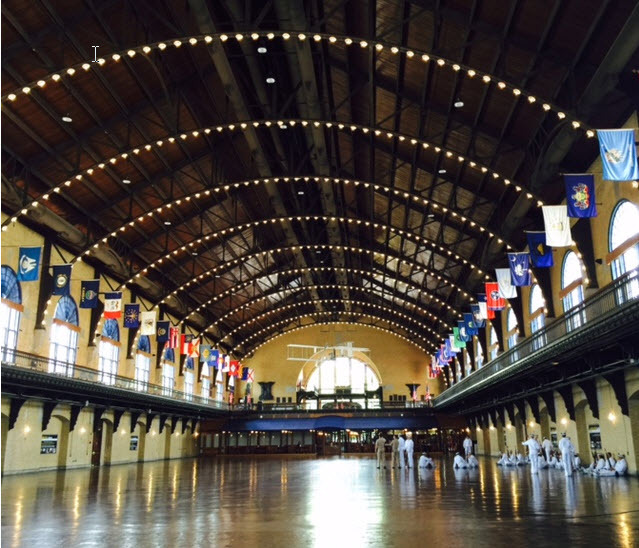 No visit to Annapolis is complete without a trip to the Naval Academy located in the heart of town. Our lively guide was Mike Zitzman who regaled us with curious backstories and little known facts on the history of the 338-acre property as well as the program for midshipmen (women are called midshipmen too). Did you know that during their training each cadet must wear a water-filled fanny pack? This new regulation was implemented to ensure cadets are not dehydrated while practicing their drills. On campus many of the buildings, including the dormitories housing over 4,000 students, are open to the public. 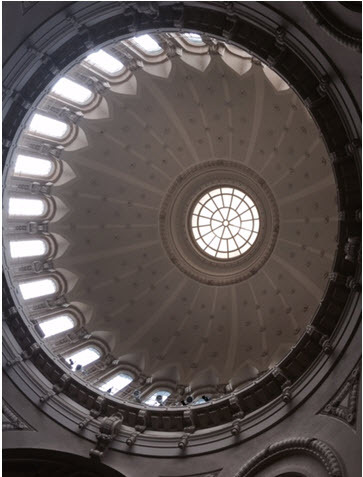 Check out the museum at Preble Hall for paintings, antique model ships and fascinating salvaged artifacts, and the awe-inspiring Main Chapel to see the largest pipe organ in America and marvel at its massive Tiffany stained glass windows. 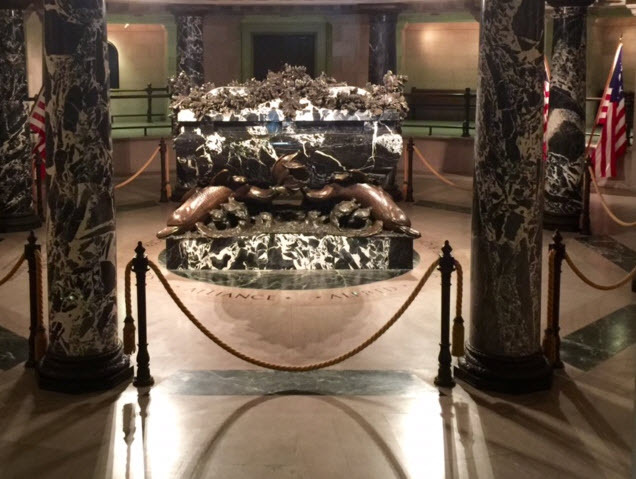 Beneath the chapel you’ll view the crypt and marble sarcophagus of Commodore John Paul Jones, the most celebrated Revolutionary War naval hero. 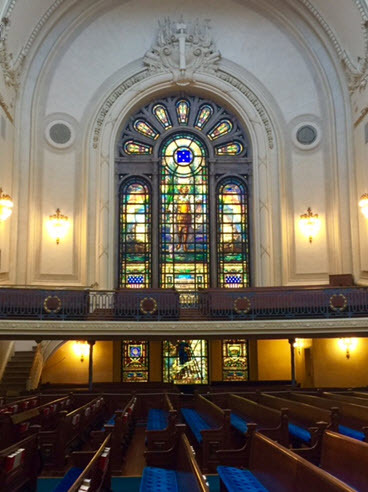 There is also the Levy Center, a place of worship for midshipmen of the Jewish and Muslim faiths. Book this special guided tour through the hotel or drop in at the Armel-Leftwish Visitor Center. A 3-mile drive from town is Great Frogs Winery, a 100-year old former tobacco farm with placid views of the rolling countryside. 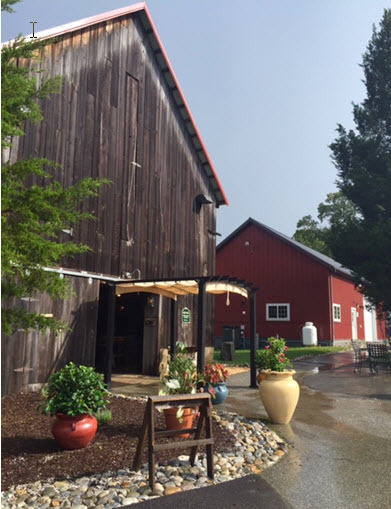 Located on the Chesapeake Bay, its rustic tasting room is housed in a former tobacco drying barn. Arriving at the height of a summer downpour proved to be a cozy complement to our tasting as we relaxed to the sound of the rain hitting the tin roof. The winery is run by Californians, Nathaniel O’Shea and Andrea O’Shea, who have planted a wide variety of grapes in this sandy Maryland soil. 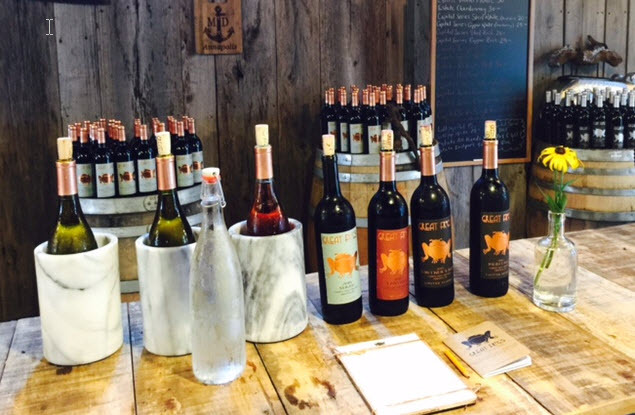 We especially liked their 2014 Vintner’s White and an exceptional aged port straight from the barrel. 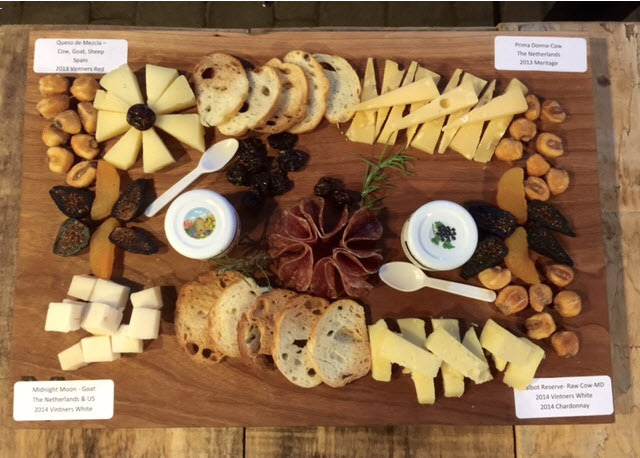 It is a fine place to while away an afternoon over delicious locally-sourced cheese and charcuterie. 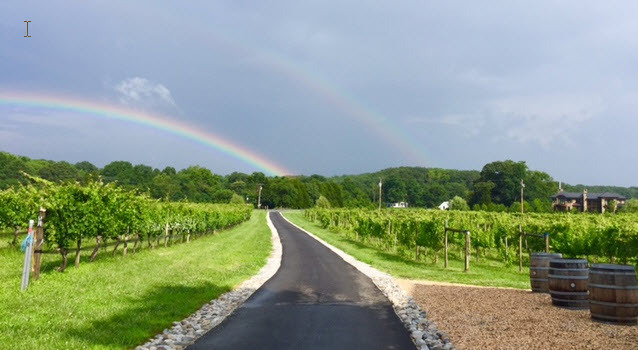 As the rain subsided and the sun glistened over the vines, we were treated to a double rainbow. How lucky can you get? Getting out on the water is part of the adventure and there are a number of options to choose from. 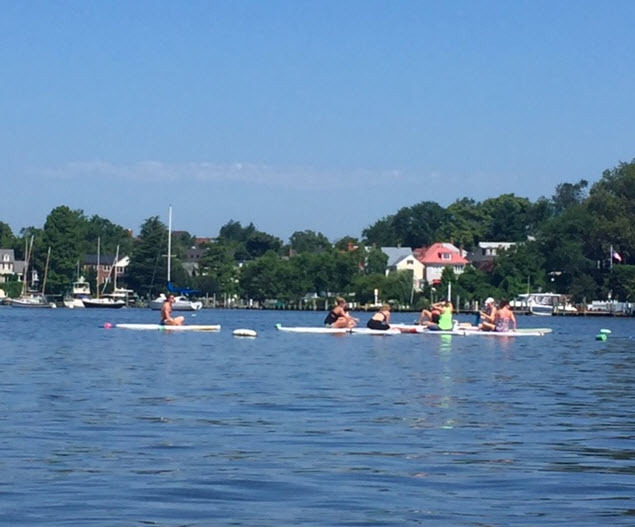 If you’re a fan of standup paddleboarding (SUP), the latest form of exercise is yoga sessions on SUPs. Head over to Capital SUP to see professional paddleboard racer Brian Meyer. His boathouse is in town on Spa Creek beside his stepfather Barry Levinson’s beautiful grey-shingled home. If you prefer a captain at the helm of your ship, go big – as in a 74-foot double masted wooden schooner rigged with four sails. From the hotel’s docks catch the breeze on The Woodwind and sail the Chesapeake Bay on a two-hour cruise. Book the special “Wine in the Wind” tour on August 28th. This French Burgundy tasting with hors d’oeuvres is a three-hour cruise. 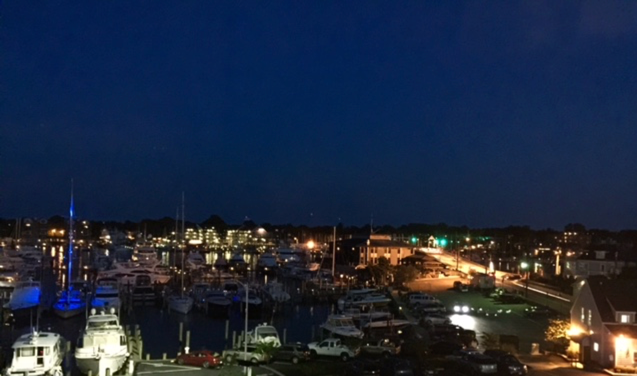 If you’re staying at the Annapolis Waterfront Hotel where the ship docks, be sure to ask for the special room + sail rate. 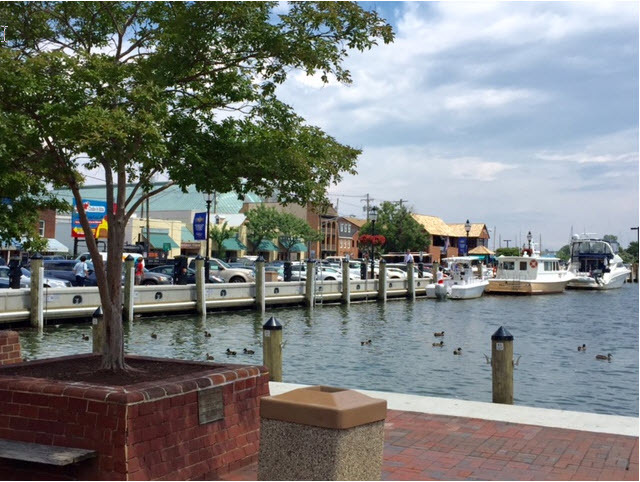 Annapolis has always been tops in seafood restaurants, and frankly, a lot of us come here for the sweet Maryland blue crabs, the famed rockfish and the oysters, many of which are harvested from the world’s largest man-made oyster reef. 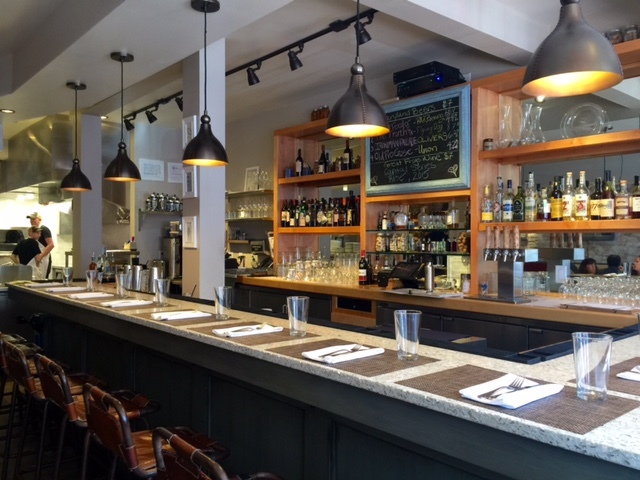 Many visitors go for fish and chips at the laidback Galway Bay Irish Pub or seafood-centric Carrol’s Creek Café for fine dining (reserve ahead for a waterside table) and Blackwall Hitch, whose latest outpost is on the harbor in Alexandria, Virginia. But if you’ve visited before, you may want to explore. Thanks to some insider tips, we made our way to Preserve, a rustic modern outpost for canned, pickled and fermented vegetable dishes from Restaurant Eve alums, Jeremy Hoffman and Michelle Hoffman. 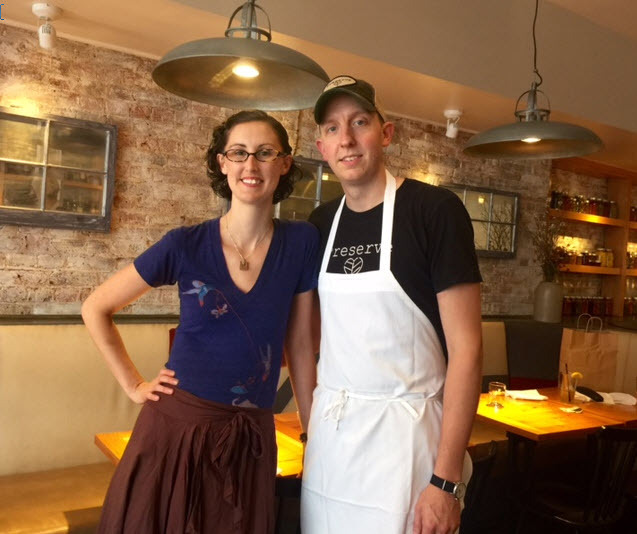 Jeremy informs his cooking from his Pennsylvania Dutch background, elevating homey small plates to a modern sensibility. Start with a few of his tangy-sweet pickled offerings. 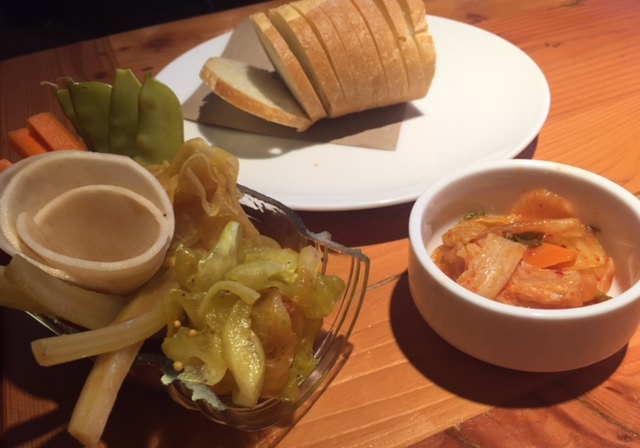 The relish dish features Old Bay Turnips, Bread and Butter Green Tomatoes, BBQ Carrots, Bloody Mary Celery, Soy Ginger Daikon and Beets lavished with dill weed. I was imagining how nicely they’d pair with wintertime fare when fresh vegetables are out of season and hearty meat dishes can be enhanced with a touch of acidity. 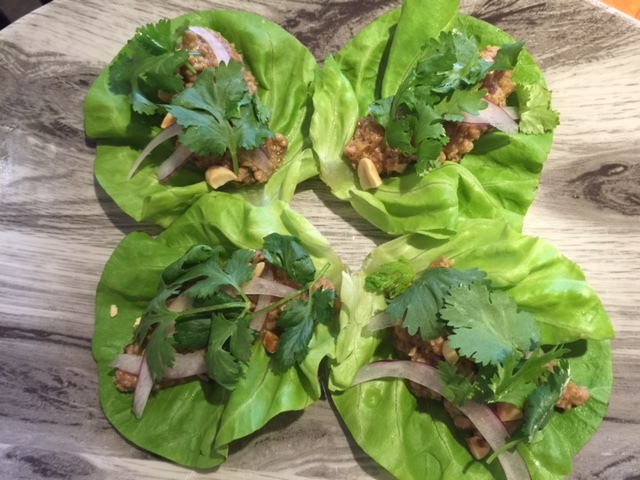 Next set your sights on some tweaked out starters like Kimchi or Minced Pork Lettuce Wraps with peanuts, cilantro and red onion. The servings are small, so you’ll want to order a few things. The menu lists a number of meat dishes to choose from (the house made liverwurst called to me). Vegans will delight in discovering the Oyster Mushroom Po’boy. I savored the Pennsylvania Dutch Chicken Pot Pie with its golden crust. Jeremy’s Cabbage Alley line of raw, vegan and gluten-free “ferments” – sauerkraut, kimchi and curtido – are available by the jar. Another unique spot is the iconic Chick & Ruth’s Delly, which is not spelled “deli”, though it certainly is. 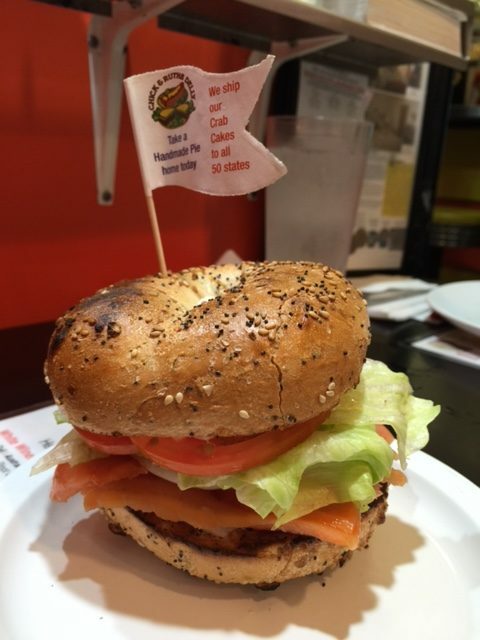 This beloved four-generation establishment is the be-all, end-all of Jewish delis. Unfortunately, many of these wonderful outposts of traditional Jewish cookery have gone out of business, yet this stalwart is still going strong. Why? Well, I’d say it’s because they don’t stint on friendliness, food or quality. 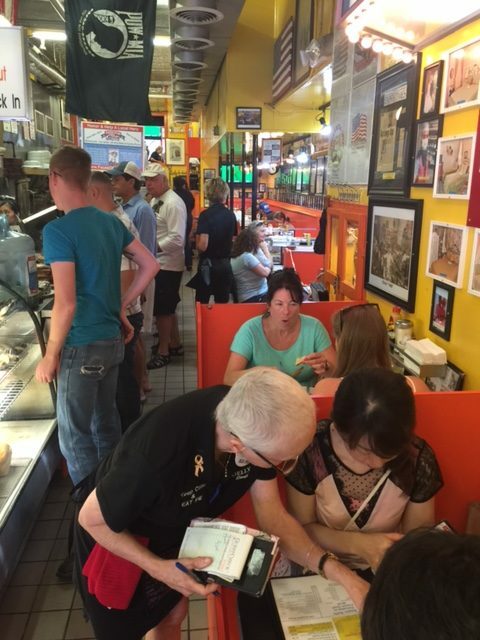 The waitresses are cheery, the platters are heroic and the homemade pies are legendary. With twenty-four flavors to choose from, the pie menu alone is testament to Chick and Ruth’s patriotic commitment to freedom of choice. As a popular hangout for the capital’s lawmakers, politicians’ photos line the walls going back to the 60’s. 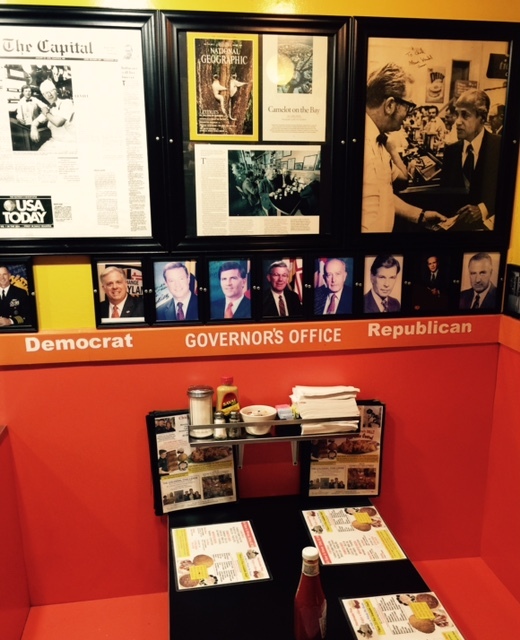 There’s even a specially reserved table for the Governor’s Office, be they Republican or Democrat. Townsfolk will tell you that every newly elected governor has come here and stood beside both locals and out-of-towners to salute the flag and say the Pledge of Allegiance on their first day in office. You too can participate in this unique observance every weekday morning at 8:30am. Though featured on the Travel Channel’s Man v. Food for 6-pound milkshakes and a 3-pound “Super-Duper Colossal” cheeseburger, we nonetheless settled for something far less challenging. After all it was breakfast and, though you can get breakfast, lunch and dinner all day, a cheeseburger in the morning wasn’t exactly what we had in mind. My advice? Go for the Belgian waffles with homemade fruit toppings, the smoked salmon with all the accoutrements served on an epic in-house made bagel, or the Maryland lump crabmeat omelets. 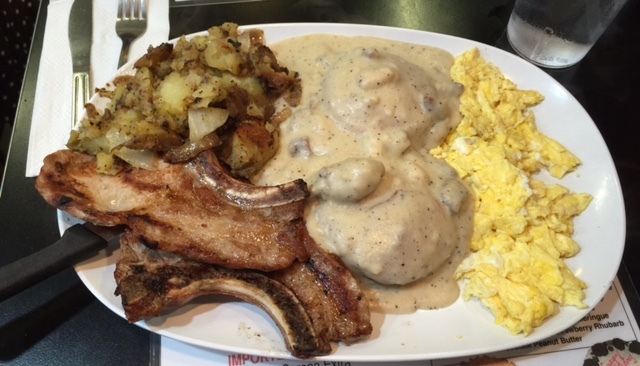 A particularly ravenous member of our group bit the bullet and happily chowed down on a duet of pork chops with creamy grits and hash brown potatoes. 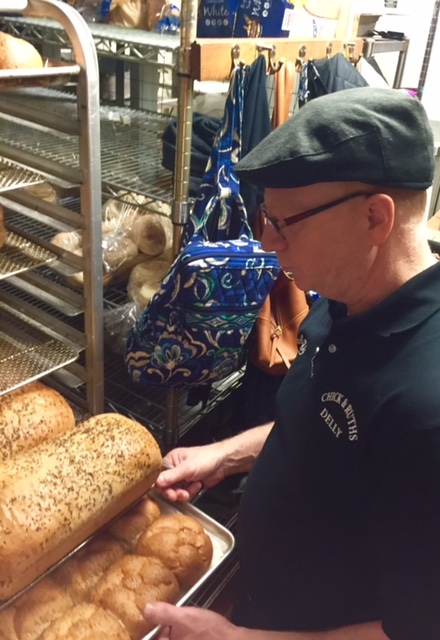 Savvy travelers will take home at least one of those splendid pies and a dozen bagels.